Danilo Erricolo didn’t believe his grammar-school classmates when they kept telling him he would one day be a college professor. He does now. 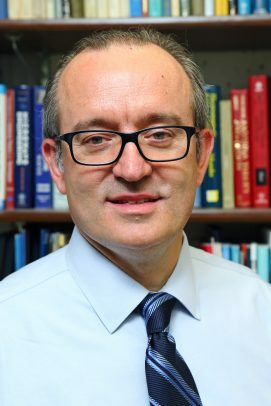 Erricolo, professor of electrical and computer engineering, felt he would one day work as an engineer in a corporate environment. As he was nearing completion of his Ph.D., his interests changed, and he became what his former classmates knew he would become so many years earlier. Erricolo came to UIC as a doctoral student from his native Italy in 1995 and he has never left. He received his Ph.D. in electrical engineering computer science, joining the faculty in 2004. He became a full professor in 2012. In addition to teaching, he conducts research on electromagnetic modeling, ground penetrating radar, wireless communications, radio wave propagation, and magnetic resonance imaging. He enjoys teaching his students, and provides them with unique experiences beyond a traditional classroom setting. Erricolo annually attends the National Radio Science Meeting in Boulder, Colorado. Two years ago, he challenged his graduate students in his Electromagnetic Scattering course to write abstracts and submit them to the conference. Eight did so, and all of them were accepted. Seven of the students traveled to Boulder to present their work. For someone who never thought he would be an educator, Erricolo does it well. In 2013, he was selected for the UIC Teaching Recognition Program; twice he received the College of Engineering Faculty Undergraduate Advising Award and once the College of Engineering Teaching Award; he was the recipient of the UIC Areas of Excellence Program Award; the College of Engineering Faculty Research Award; and the College of Engineering Gold Faculty Research Award. Throughout his career, Erricolo has received more than $8 million in research funding. In 2016, he was named a Fellow of the Institute of Electrical and Electronics Engineers (IEEE) and serves as editor-in-chief of the journal IEEE Transactions on Antennas and Propagation.